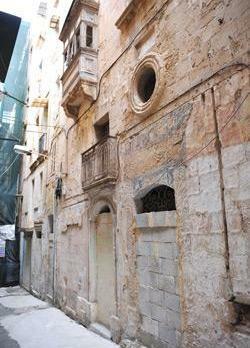 The Attorney General’s office will be moving out of the President’s Palace in Valletta to occupy the “most significant” building in Strait Street, much to the dismay of the foundation set up to rehabilitate the area. Its chairman, Fr Peter Serracino Inglott, said it had plans for Casa Corogna – once the residence of actors and artistes – and the AG’s office just did not fit into its idea to revive the street to the cultural centre it used to be. The shift is a result of the project to restore the palace in St George’s Square to its former glory and, in fact, even the Malta Community Chest Fund, the Public Service Commission and Parliament are being relocated, leaving only the President’s office there. The government is identifying alternative sites for the entities housed in the ground floor but the choice of building for the office of the AG, Casa Corogna, has not been welcomed by the Strait Street Foundation. “Had I been aware of the plans at the appropriate time, I would have voiced my objections. But, at this point, that opportunity has slipped away,” Fr Serracino Inglott admitted. He regretted the government’s decision, admitting it was too late to take any action now, the foundation having been set up after the choice was made. The building in question was destined by Grand Master Manoel de Vilhena himself to be a residence for actors and artistes performing at the Manoel Theatre and this was commemorated in a marble plaque on its façade, Fr Serracino Inglott pointed out, saying it was a pity it would now lose that cultural function. The foundation was set up to promote a rehabilitation project for the whole of Strait Street and restore its historic function as a centre of cultural activity. In fact, the foundation planned what were known as diffused hotels, whereby the main reception area was in one building and the rooms were spread around others, Fr Serracino Inglott said, adding the AG’s office did not really fit into that scenario. While admitting that an element of the legal world already inhabited Strait Street, what with the back door of the law courts leading to it and lawyers’ offices mushrooming in the vicinity, he said the foundation would not have wanted to further increase its presence. It had intended to transform parts of Casa Corogna into a museum of Strait Street to “recall its past hours of glory and the many exciting stories” linked to it. “Strada Stretta” was, after all, the street where duelling occurred between the knights, Fr Serracino Inglott pointed out. “Many people just associate The Gut, as it was popularly known, with prostitution. But, in fact, it was full of variety and music halls, which were the cradle for the development of jazz in Malta and some of our best bands. “Some of the performers, singers, dancers and acrobats, mainly from abroad, were among the best artistes in their genre,” Fr Serracino Inglott said. A planning authority permit, the application for which was filed back in 2000, for the demolition of the internal structures to make way for the offices was still pending but it was imminent, a spokesman from the Office of the Prime Minister said. It was too early to give timeframes but the next step would be to issue a call for tenders and award the contract for the works on the old building to start.